MOSCOW (Sputnik) — The United States needs to reconsider providing aid to all jihadist groups operating in Syria as they are committing atrocities against civilians on a daily basis and the reported beheading of a child by the US-backed Nour al-Din al-Zenki rebel faction fits into a pattern, Tarek Ahmad, a member of the Hmeymim group of internal Syrian opposition, told Sputnik on Friday. On Tuesday, US State Department spokesperson Mark Toner said the United States would reconsider providing aid to the Syrian rebel group Nour al-Din al-Zenki if reports are confirmed that members of the faction beheaded a child. "I think it is possible that the United States will change their policy towards this particular group but, if fact, they need to change their strategy of dealing with every so called military opposition group in Syria including the Free Syrian Army (FSA) and Jaish al-Islam as this boy is not the first victim of these fanatics," Ahmad said. He reminded that the Free Syrian Army includes the Farouq Brigades, which several years ago gain notoriety when one of its commanders was filmed eating a heart of the Syrian soldier. Ahmad stressed that the Syrian population is tortured and killed on a daily basis adding that the international community and the United States should add those groups to list of terrorists instead of waiting for another televised murder. "There are no moderate Syrian opposition groups," he claimed pointing that "all of them are Islamists and fanatics, all of them Wahhabi fundamentalists that think the same way spreading extremism with total impunity." Earlier in July, a video emerged in the social media showing a boy of around 10 years old sitting on the back of a truck surrounded by several men accusing him of being a member of Liwa al-Quds, a Palestinian militia that supports the Syrian government. The second video emerged showing the boy’s murder. 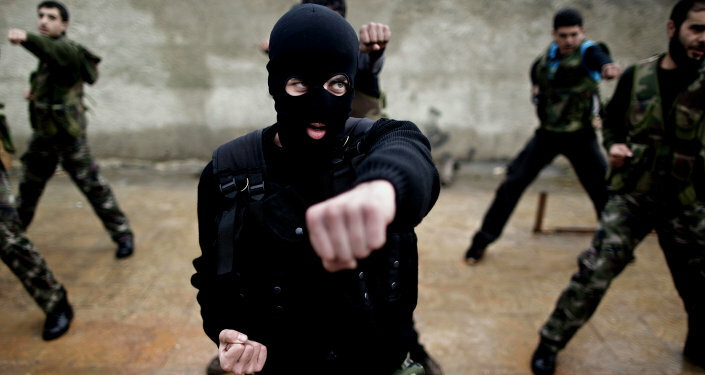 The Syrian rebel group Nour al-Din al-Zenki is believed to have committed the murder. It posted a statement on its Facebook page calling the killing an "individual mistake" and promising to investigate it.